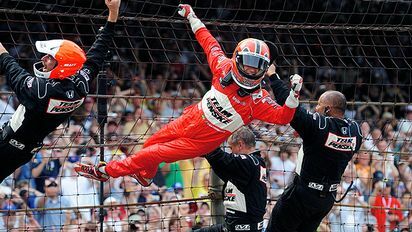 Castroneves was in a fence-climbing mood after Sunday's 500 win. A month ago, Helio Castroneves was facing a possible prison term while standing trial for federal tax evasion. Sunday, he was in Victory Lane at Indianapolis Motor Speedway after winning the biggest race of his life. It was a historic day for Indy 500 winner Helio Castroneves. For the 32 other drivers Sunday? Not so much. Castroneves, Franchitti, Patrick or Tracy? Kanaan, Rahal, Foyt or Andretti? Who will write the storybook ending for the 93rd Indianapolis 500? The favorite to win Sunday's Indy 500? The dark horse? John Oreovicz breaks down the field. Blount: Passion still fuels "The Captain"
Three words help define Roger Penske the man: passionate, relentless and loyal. One word best defines Penske the Indy race team owner: unequaled. Some bad news for the 32 other drivers hoping to etch their names on the Borg-Warner Trophy: Helio Castroneves is back, and so is that killer smile. Danica Patrick stormed into the spotlight at the Indy 500 in 2005, but her stormy demeanor has made as many headlines as her driving since then. An older and wiser Danica is ready to change that Sunday. An exhausted John Andretti spent Bump Day in -- and out -- of the Indy 500 field. With less than 10 minutes to go, he finally put the Richard Petty car in the show. Bruno Junqueira turned a handful of practice laps and an excellent qualifying run on Bump Day into an Indy 500 start. Teammate Alex Tagliani wasn't so lucky. In the end, it all worked out for Dario Franchitti. The 2007 Indy 500 winner jumped from the NASCAR unemployment line to the "best seat" in the IndyCar paddock. Dan Wheldon should have high hopes for adding a second Indy 500 win to his résumé. But a slow start with Panther Racing has the 2005 IndyCar champ playing catch-up. There were costly crashes and tense moments for the second round of Indy 500 qualifying, none more so than Scott Sharp coming through to make the field on the final laps of the day. Helio Castroneves took the pole for the 93rd Indianapolis 500, but other than a few crashes along the way, there wasn't a lot of drama to be had Saturday at the Speedway. With serious public trouble behind him and the pole position for the Indy 500 before him, it's looking like a very special year for the effervescent Helio Castroneves. With practice slated to start Wednesday, Pole Day on Saturday and four days of qualifying over the next two weekends, the buildup for the Indy 500 is in full swing. The song "Back Home Again in Indiana" will be performed, the balloons will fly and the 93rd Indianapolis 500 will roar to life May 24. The greatest spectacle in racing? It so often is. IndyCar drivers have two goals every season: win the Indy 500 and the championship. With a win at Kansas on Sunday, Scott Dixon hopes he's ready to repeat both those feats. What's new for IndyCar in 2009? Plenty. From the return of Dario Franchitti to the early absence of Helio Castroneves, '09 promises to be a season of change.